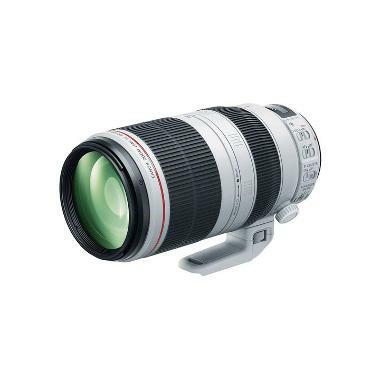 The Canon EF 100-400mm f/4.5-5.6L IS II USM Lens is a versatile telephoto zoom designed for both full frame and crop frame sensor cameras. It has a weather-resistant barrel, making it suitable for wildlife and outdoor sports shooting. A dedicated tension ring allows you to customize zoom torque and the rotation-type zoom ring offers precise adjustment between zoom positions, especially when shooting handheld. Note that while the original 100-400mm sports a push/pull zoom design, this version uses a rotation-type zoom ring more common to Canon lenses. The Canon EF 100-400mm f/4.5-5.6L IS II can be paired with both full frame sensor cameras, such as the Canon 5D Mark III, and with crop frame sensor cameras, such as the Canon 7D Mark II. The focal length equivalent on crop frame sensors is 160-640mm. Please see our notes on limited compatibility with the 2X and 1.4X Canon extenders. "Air Sphere" coatings have been applied to the lens elements to reduce flaring and ghosting and proper light transmission is maintained even in super high contrast/strong lighting conditions. This lens is ideal for outdoor shooting, especially on subjects that are constantly changing distances. • This lens is compatible with Canon EF mount cameras in both full frame and crop frame sensors. The focal length equivalent on crop frame sensors is 160-640mm. • This lens is compatible with the 1.4X Canon extender. AF is not retained on most camera models and MF must be used on the lens. AF is confirmed to work well on the 7D Mark II and the 5D Mark III when using the center AF point only. Results may vary, experiment at your own risk. • This lens is compatible with the 2X but you must consider that this will result in an f/11 maximum aperture on the lens and MF will be your only focusing option. • Unlike the prior 100-400mm, this lens does not have a push/pull design and instead features a typical rotation zoom ring. Zoom tension control is still maintained.